The participation in NEStOR project was for Aalborg university (AAU) a very constructive experience. First of all, we had the chance to collaborate and exchange ideas with partners from different countries and with different involvement in NEStOR project. Especially with some members of European School Radio (ESR) team, we had a closer and more often communication, and they helped us a lot with their web radio experience in practice. In order to solve some problems, we had both skype meetings and fruitful direct contacts. Moreover, we had an effective coopereation with Pedagogical Institute of Cyprus (CPI), since our partners from there prepared the template for the learning scenario both in micro and macro level. For us this was the basis on which we relied in order to produce the actual learning scenarios for the schools. For that reason we exchanged many emails, so as to get feedback and to clarify any misunderstanding or ambiguity. This collaboration helped us a lot to create a guide on developing educational scenarios for the web radio to be used by schools. Through specific steps, this guide aims to scaffold schools and teachers towards the development and implementation of NEStOR learning scenarios. Both some members of ESR team and CPI helped us to create some social networks with specialists in teaching students with visual impairment. We exchanged emails with educators who work in a school for blind students and with people who take action in a centre for the education and rehabilitation of blind people. The contact with specialists on the field of visual impairment helped us to adjust the previous guide template, so as to help educators that have in their classroom one or more students with visual impairment. AAU has also reviewed the relevant literature on the importance of information literacy and particularly of the web radio in education. We researched the pedagogical value of web radio, as well as the activities that are related to web radio. As far as the importance of information literacy in education is concerned, we covered many aspects of that term, like its impact on students’ learning. Moreover, we reviewed the skills and the dexterities that both students and educators are supposed to have so as web radio and media to be used in education, taking under consideration students with visual impairment. Trying to help educators to introduce and incorporate media, especially web radio in extra curriculum activities, we prepared two separate examples, one for the elementary and one for the secondary education. Both examples are based on specific steps which educators can follow in order to produce a radio show with their students. Apart from the aforementioned closer coopereations, all partners that contribute in NEStOR project had skype meetings once per month where we discussed both things having to do with specific intellectual outputs and other more general issues (e.g. financial issues). 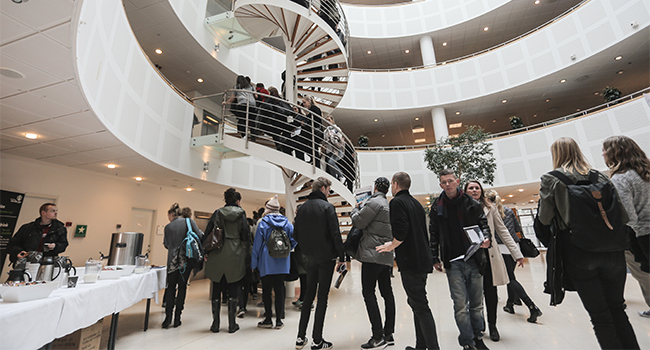 Furthermore, Aalborg university organised the 2nd Transnational Partnership Meeting of the NEStOR project in April 2017, where all partners presented their achievements so far, while they had the chance to see the facilities of Aalborg university. Finally, Aalborg university has already disseminated NEStOR project in some external events, and, as a leader for the dissemination plan, supports intellectual output leaders in execute dissemination efforts, updates the dissemination and exploitation plan, and relates any potential dissemination opportunities to the appropriate intellectual output leader. In March 2017, AAU posted on Facebook the post “spil i skolen”, in order to recruit Danish schools and to attract students’ interest. In the 23 and 24 of May AAU presented NEStOR project to the Conference “Exploring teaching for active learning in engineering education” in Odense, which is a town in Denmark.